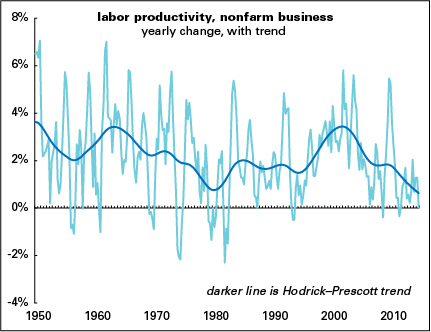 The productivity slowdown: Is structural stagnation our fate? In my widely overlooked book, After the New Economy, I initially took a very skeptical line towards the productivity acceleration of the late 1990s. I dismissed it as temporary and bubble-like, and an artifact of very imperfect measurement. When I wrote a new afterword for the paperback edition, though, I recanted my skepticism: the acceleration seemed to be going on long enough that, as painful as it was to admit, the bourgeois functionaries were right. Robert Solow’s famous 1987 quip, “You can see the computer age everywhere but in the productivity statistics,” had finally been repealed. I should have stuck to my guns. The productivity acceleration was already losing air as the hardcover version of the book appeared, and was pretty much history by the time the paperback came out in late 2004. And now things look worse than they did during the infamous productivity slowdown of the 1970s and 1980s. What happened? The consensus of the academic work on the acceleration was that while it took a while to have practical effect, the computer revolution was finally exerting its magic on economic life. The enthusiasm around high tech led to an acceleration in investment, investment that paid off in the form of the productivity acceleration. (It also gave rise to one of the great bubbles of all time, the dot.com mania, not to mention a lot of bunkum about the end of recessions and the birth of a new world of flatter hierarchies and meaningful work, but I’ll hold off on the mockery for now.) The unemployment rate got below 4%, and wages grew across the entire distribution, and within every demographic group—until it all came to an end with the bust of 2000–2001. Here’s a graph that puts the productivity acceleration in perspective. Note that during the economic Golden Age—roughly 1950–1973—trend productivity growth averaged 2.8% a year. That sank to 1.5% between 1974 and 1995, then rose to match that 2.8% figure between 1996 and 2005. At the end of last year, trend productivity growth was a dismal 0.6% a year, the worst since these modern numbers began. What happened? 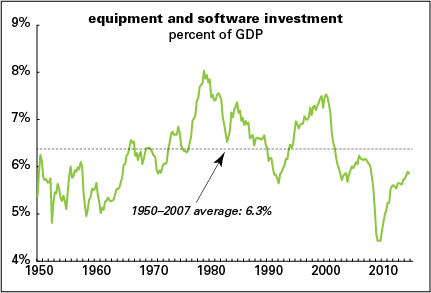 For one, the rise in investment in equipment and software—much of that in information technology (IT)—that drove the late-1990s acceleration went into reverse, as the following graph shows. The decline came in several phases—a sharp drop after the dot.com bubble burst in 2000, which was very partially reversed in the mid-2000s, only to collapse further during the Great Recession. Most of that recent collapse has been retraced, but it’s still below its 2007 peak, which itself was way below the 2000 peak. Recent levels are well below the long-term average shown by the dotted line. But it’s not just about quantities. A qualitative explanation has just arrived from the Federal Reserve Bank of San Francisco’s frequently-interesting Economic Letter. In it, economist John Fernald and Bing Wang. Their analysis is that “the low-hanging fruit of IT-based innovation had been plucked.” (They’re economists, so they can be forgiven the use of that cliché.) Just as the acceleration of the late 1990s was driven by IT-using and heavy IT-using industrial sectors, the slowdown has been led by those sectors as well. In other words, the magic has gone out of IT. Though they don’t endorse it explicitly, this sounds reminiscent of the analysis of economist Robert Gordon (as in this paper), who argues that we’ve exhausted the great innovations in info tech, which themselves were rather minor when compared to the achievements of earlier industrial revolutions like the steam engine and the railroad. Why does this all matter? Productivity growth puts an upper bound on economy-wide income growth. Politics and institutions determine how that growth is distributed—for the last few decades in the U.S., most of those gains have gone to the top tiers. That need not be, if politics and institutions change. Stronger unions, better labor law, and a more civilized welfare state could change how income is distributed. But if productivity growth remains this slow, or picks up to the 1% range that Gordon foresees, then there’s a lot less to (re)distribute. And if this is so, then structural stagnation will long be with us. « Support KPFA! Get Best of Behind the News, vers 6.0! I’m going to wait and see if growth gets any stronger (and if productivity returns then). Can’t believe this is actually making me nostalgic for Greenspan. At least he kept driving an expansionary monetary policy (like most of the Postwar Period) when most of the others on the Federal Reserve Board were predicting the Dread Inflation if unemployment went so low that it might actually start driving up wages. This is a disheartening analysis. Things are so bad now with modest to no real expansion, I can only imagine what things will be like with structural stagnation being predicted. In a recent paper, Fred Moseley argues that, in developed countries, we are reaching the limits of increasing the surplus-labor portion of the working day. Recent estimates of the rate of surplus-value in the US range from 2.6x (Mohun) to 3.2x (Paitaridis and Tsoulfidis), approximately doubling from 1.5x in the 1970s. Thus, surplus-labor today already occupies most of the working day in the US (and probably other developed economies); about 5-6 hours of an 8-hour working day. So it gets more difficult to increase surplus-labor and surplus-value per worker still further from here on. There is not much necessary labor left that can be converted into surplus-labor. Are Moseley et al articles available online (sans firewall)? There’s very little reason to run out and get the newest Windows release now. When Windows 95 came out it was a revolution of sorts.